Abbas Hamideh, a "Palestinian right of return" activist and founder of Al-Awda, was one of the main organizers behind a Sunday protest that began outside the White House and ended outside the American Israel Public Affairs Committee (AIPAC) policy conference. Hamideh, who has repeatedly called Israel a "terrorist entity" and has equated Zionists to Nazis, organized a protest of over 150 activists outside the White House. The crowd, which consisted of several young white activists, started gathering outside the White House at noon for a little over an hour and then started marching towards the convention center where AIPAC kicked off their three-day conference. "We’re ready to roll for tomorrow! Thanks to all that came out to @AlAwdaROR workshop! See you all tomorrow @ the White House (12PM)!" Hamideh tweeted on Saturday night. In addition to Al-Awda, Students for Justice in Palestine, Answer Coalition, Code Pink and Neturei Karta, delivered speeches condemning what they call the Israeli occupation in Palestine. Others activists were there showing their support for freshman Reps. Ilhan Omar (D., Minn.) and Rashida Tlaib (D., Mich.), the first two Muslim women to serve in the House of Representatives. "I was honored to be at Congresswoman @RashidaTlaib swearing in ceremony in #Detroit and private dinner afterward with the entire family, friends and activists across the country. #Palestine #TweetYourThobe #RashidaTlaib," Hamideh tweeted. In addition to chanting about the support of the Boycott, Divestment, and Sanctions (BDS) movement, which wages economic boycotts on the Jewish state and its people, one of the other organizers associated with Hamideh chanted, "Israel is a terrorist state." 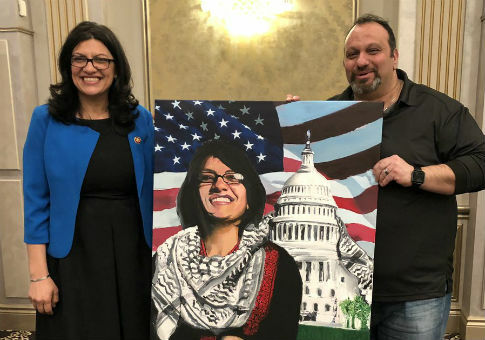 This entry was posted in Politics and tagged AIPAC, Israel, Rashida Tlaib. Bookmark the permalink.